The focal point of this crossed arrows shield is a genuine buffalo horn that has been polished to bring out it's beauty. The backdrop is a pad of white rabbit fur and the hoop is also wrapped in rabbit fur. This shield is 16" in diameter and approximately 39" long, not counting the leather hanger strap. On one side of the buffalo horn is a dream catcher wrapped in gold buckskin. Tiny crystal beads accentuate the web and the streamers are made from buffalo hairpipe beads, crystal bicone beads and brass beads and cones. 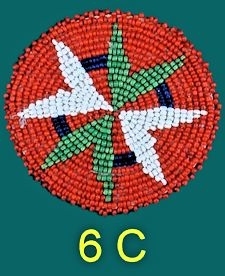 On the other side of the horn is a buckskin medicine wheel, with the traditional colors done in glass crow beads. A miniature medicine bag is tied to the center. 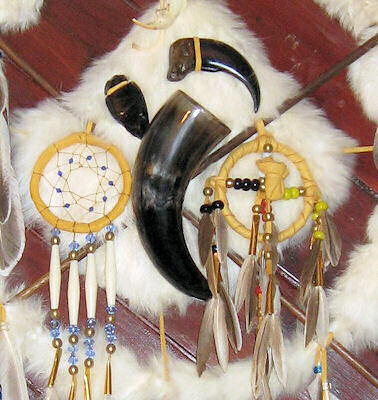 Surrounding the dreamcatcher, buffalo horn and medicine wheel are a simulated grizzly bear claw, a large obsidian arrowhead, and a muskrat jaw. The crossed arrows are constructed by hand in the old way with feathers tied on with artificial sinew and real stone arrowheads. The twenty-four buckskin fringes are coverd with dozens of duck feathers held on with glass crow beads, brass beads and brass cones.